Jin Shin Jyutsu (JSJ) is an ancient pressure point healing practice that was handed down from generation to generation, but over time this practice was all but forgotten. What is Jin Shin Jyutsu (JSJ)? The translation of JSJ is “The Art of the Creator through Compassionate Man”. For thousands of years, ancient peoples used JSJ to heal both themselves and others. This practice was rediscovered in the early 20th century by Master Jiro Murai, a Japanese healer and philosopher, who applied this technique in response to his own health problem. One of his most dedicated students, Mary Burmeister, introduced JSJ to the West in the early 1960s, and today JSJ is taught worldwide. The practice of massaging or puncturing pressure points is based on a holistic approach to medicine, where the entire body and all its organs and systems are connected, with one area interacting with other areas. JSJ is a type of acupressure that works with a set of 26 points along energy pathways. It uses the fingers and hands to release blocked or overloaded pathways to harmonize the energy in the body, to boost energy levels, calm the mind and balance the emotions. The philosophy behind that practice is that the body itself can correct and adjust the energy pathways, and once body returns to balance, the person experiences physical, mental, and spiritual harmony. Pressure point stimulation, whether by massage (acupressure) or through stimulation with fine needles (acupuncture) dates back to ancient times in the far east. I’ve already written on how to massage the pressure point Zu San Li and what will happen to your body when you do that, and I’ve also mentioned that massaging certain pressure points can quickly clear a stuffy nose and may even help with migraines and headaches. You can find instructions on how to do JSJ (including a video) towards the end of this article. This study has been conducted in Markey Cancer Center, University of Kentucky, Lexington. The aim of the study was to check the effectiveness of JSJ in relieving pain, stress and nausea in cancer patients. The study demonstrated that patients who had at least 3 sessions of JSJ experienced significantimprovement in the areas of pain, stress and nausea after each JSJ session. A follow up study which will be more comprehensive and extensive is scheduled in the future to test more parameters. The results of this study were published in the Journal of holistic Nursing in 2014. The purpose of the study was to evaluate the effects of JSJ on nurses. The daily life of the working nurse has been shown to be a stressful one and the stressors that nurses feel can affect patient care. The results showed significant increases in positive outlook, motivation, calmness, and significant decreases in anger, stress, depression, and morale issues. The nurses reported less muscle aches, sleeplessness and headaches. The study also showed significant increases in nurses’ caring efficacy to patients. The study suggests that JSJ may be a valuable tool for nurses to decrease emotional and physical stress and increase caring efficacy. Karen Searls, a qualified therapeutic massage practitioner from the Center for Health and Healing. Dr. Jacqueline Fawcett, from the University of Massachusetts, Boston. The purpose of the study was to evaluate the effectiveness of 10 weekly treatments of JSJ for women diagnosed with breast cancer. On average, the women reported that JSJ was very helpful in achieving their goals such as feeling better physically and emotionally, having more energy and decreased pain. What’s good about JSJ is that you can receive a session from a JSJ practitioner, or we you can treat yourself at home with JSJ. Doing JSJ at home is simple and includes holding your thumbs and fingers for a few minutes each on a daily basis. The effect of holding each finger is accumulative so the longer we hold, the better we can feel. You can do JSJ anytime anywhere: when you watch TV, reading a book or waiting in the line. 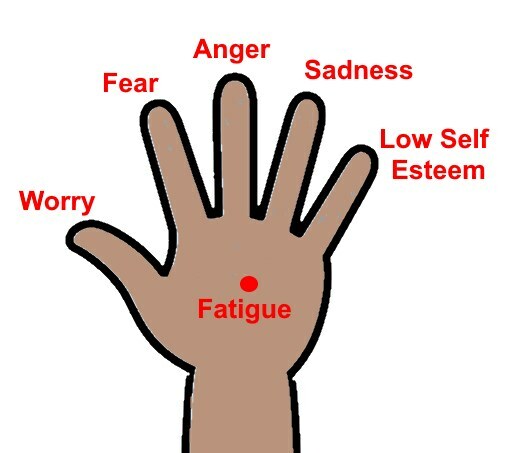 In JSJ each finger is connected through meridians to specific organ system in your body and also to an emotion. If you experience an emotion now, then choose the finger that is related to this emotion, or if you have time run through all the fingers. To do JSJ at home sit or stand quietly, hold the finger gently with the opposite hand for 2-5 minutes, notice how you feel and breathe. Usually you will begin to feel a pulse in the finger. However if you don’t feel the pulse this is okay too and it doesn’t mean that it’s not working. Here is a videos demonstrating how to do JSJ at home. Previous ArticleEven Doctors Cannot Explain This: Boiled Cinnamon And Honey Is The Cure For Arthritis, Gallbladder Issues, Cholesterol And 10 More Health Problems!